Sunrise is where you can find the most awesome destinations for tourists. There are natural sceneries, top notch accommodations, interesting entertainment centers and commercial establishments and of course fantastic nightlife where a lot of visitors and locals check out. And what better way to check all these sites than with party bus Sunrise, FL. It does not matter what occasion you have. You can use a party bus for a birthday, wedding, anniversary, bachelor or bachelorette party or reunion. You may also ride a party bus with your friends to check out special events such as sporting events, proms, romantic dinners, concerts, conferences and corporate events too. In addition to party bus rentals, we also have the best limo service in Sunrise, with many more vehicles to choose from. You and your group will arrive refreshed, happy and energetic at any party or events scene. Making a reservation is easy. All you need to do is to call up party bus Sunrise to reserve and to learn more about their pricing and availability of their party buses fleet. It won’t be long till you experience the best party amenities in the city such as your very own private bar, audio and video equipment, seating and lighting just like the ones you’ll find in a club and even Wi-Fi in certain rides. Your party bus driver is also a professional and experienced driver who will take you safely anywhere in in the area. Charter bus rentals in Sunrise are also an option for school field trips, corporate travel, or even sports team transportation. The Kingshead Pub Sunrise – the place where locals and tourists love to check out with their fantastic live music ever weekends. You get to savor their unique fish and chips and of course sample the best beer in town too! Sunrise Country Club – come and dine at dining area with the most amazing ambiance and the most amazing dishes too. Enjoy live music and dancing and of course the company of the ones you love. AMC Weston 8 – the cinema which has received the highest ratings from its customers. Rated as first class because of its great amenities such as spectacular audio and video and the most comfortable theatre seats. A cinema truly worthy of your post-party celebration with the entire family. 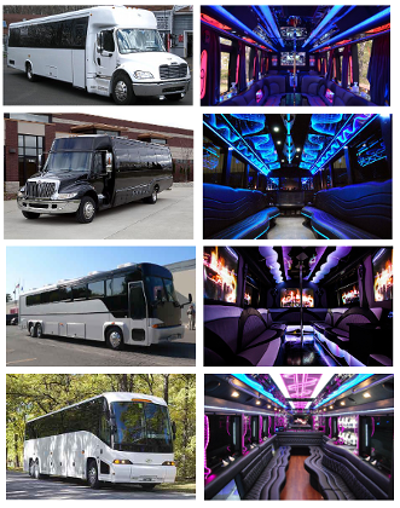 There is no doubt about it, renting a party bus is now more affordable. Your rental rates will be according to the number of people in your group, the type of bus that you wish to rent and the length of time that you will rent the vehicle. From the Fort Lauderdale Executive Airport you can immediately ask your party bus Sunrise driver to take you to your desired destination. You may also ask your driver to pick you up from the airport and take you to your hotel or accommodation first.